I became very clear about how to proceed. 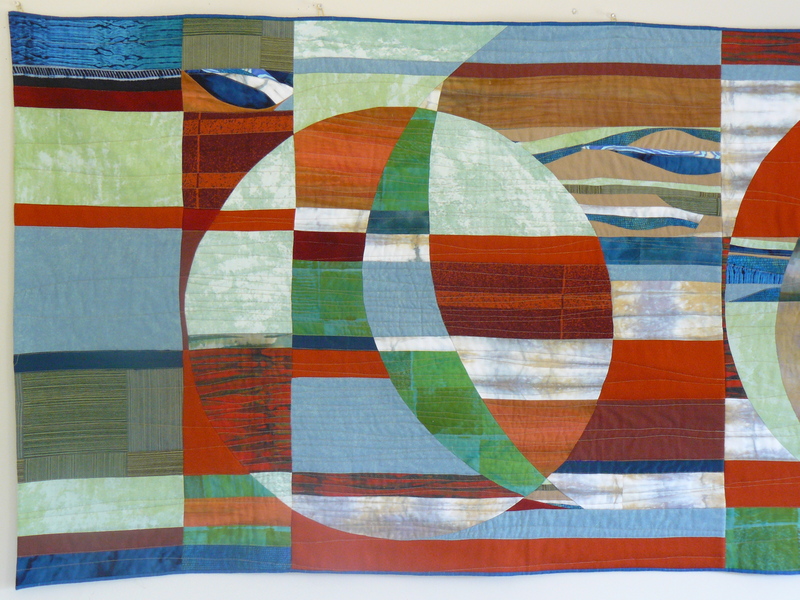 The quilt would be constructed in three sections. I took advantage of my computer graphic skills and the large printer in my office to make templates for each moon. There wasn’t any logic or rationale to why each moon came out the way it did. My eye guided the composition. I chose a varied palette of textures and types of fabric to work with, wools, cottons, hand dyed and commercial alike, prioritizing the blues and reds that Margaret seemed to be drawn to. 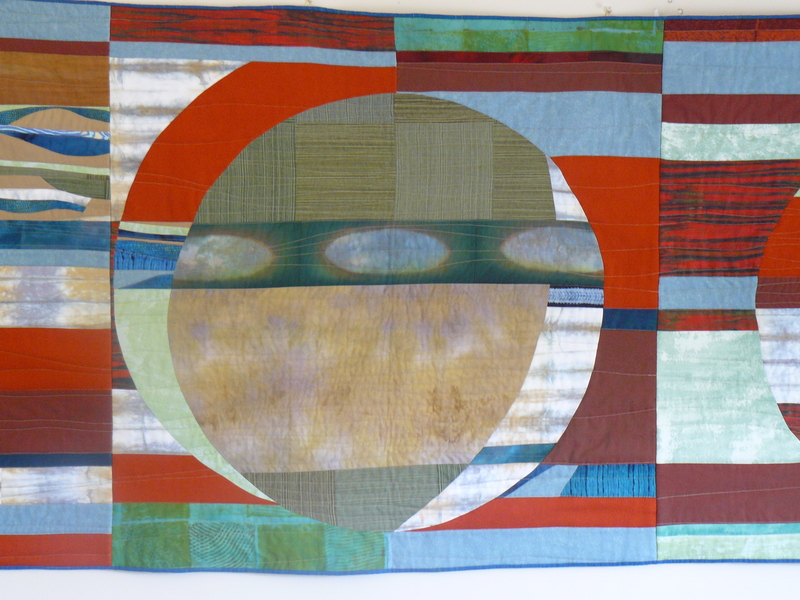 Each of the three moonscapes would be fully composed and quilted before being attached together to form the final ten foot length. I spent the better part of six months composing. My tiny studio and design wall couldn’t contain the energy of what I was feeling. Each time I came in to work, I had to lay all the pieces all out on the floor in sequence anew, to see relationships as they were developing. I would work for a day or two, and then walk away for weeks. I didn’t feel rushed or compelled to move fast. Sometimes I would enter the studio, look at what was developing, move just one piece into a new place, and walk out. Another day I would get caught up in the frenzied feeling of not being able to leave until there was both a visible and viscerally felt completion of the moonscape I was focused on. By spring of 2009 the design was complete, hundreds of pieces of fabric pinned together. It was order restored, with sections of fabric pieces fitting together just the way they were supposed to. I loved how the moons seemed to emerge from and at the same time merge with the context in which they lived. 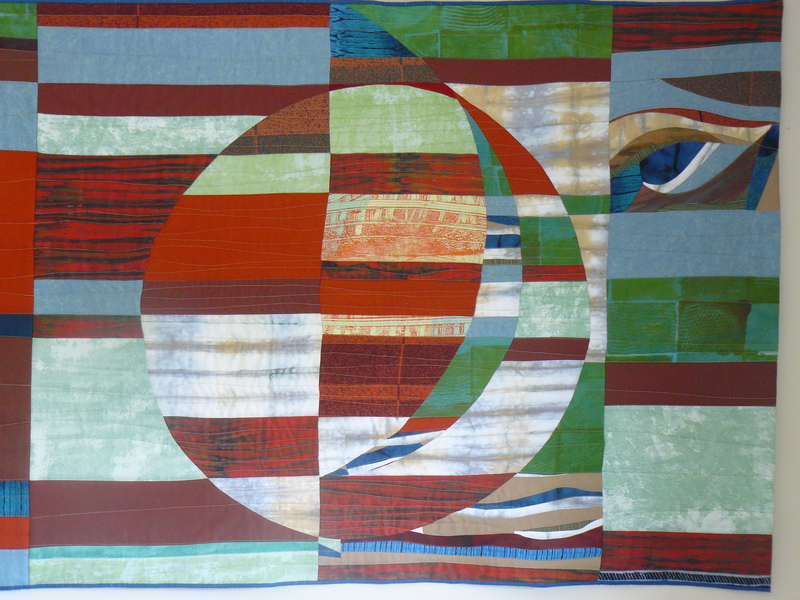 The number three played out again in the beautiful hand dyed piece of fabric that occupied and seemed to scroll through the center of the center moon, as if to draw me into some magical meaning or to some place I might be resisting going to. I hadn’t thought about the dream of the fat man for awhile but it came back now as if remind me that it still occupied the center of me in a significant way. I had been rummaging around in my stuff for years looking for the actual documentation of this dream. What I remembered clearly was driving along a country road with my husband and we stop at a small body of water to the right. It is a perfect circle, feels like a pond. There is a large man treading water right in the center of this pond, dark curly hair and wire rimmed glasses. And even though I can only see his head, I know he is very big and Buddha-like, fat. He has the most angelic smile on his face, looking at me. I enter the water to his right and he turns to face me as I swim gently toward him, feeling his smile as I approach. Just as I reach him, I wake up. Even though I could recall it so clearly, I was sure I had written it detail by intimate detail into one of my diaries. I’d been scouring all my writing back to 1995, desperate for the validation that my memory was true. I even remember telling my mother back then about a series of dreams I was having about ‘being in love with a fat man’ and that I thought this was a metaphor for an unconditional love of my husband at the time no matter what his physical form. Looking again now through my archives, I found a diary from 1980 that I didn’t even know I still had, written when I was twenty-two years old. Just the first few dozen pages had entries, seven of which were written to ‘Richard’. As I read these entries a strange familiarity passed through me. I feel a peace I have been longing to feel, maintaining and even heightening my energy level and desire to grow, and yet it isn’t the frantic longing and anxious questioning that I have always experienced. The peace I feel is one of total understanding – of the spirit – we of the words possess such an infinity of soul that I thought did not exist in this world….I just want to experience the awe of the love I feel. I was writing to a Richard of twenty-nine years ago. I was on fire all over again. The way he used to make me feel. Like the obsession with finding the dream about teacher Richard, I couldn’t let go of the surge of memory that returned with this lover Richard of the past. I was an archaeologist who had just discovered a life-changing artifact. I was a dancer, dancing a choreographed dance with an irresistible partner to all the dreaming I had done together with this man. I thought I had been in love then too. Finding the diary from so long ago felt like some kind of divine intervention. I was still negotiating unfamiliar waters of emotional turmoil but whatever had opened in me had stayed open to feeling waves that kept me firmly in a flow of questioning every love relationship with a man I’d ever had. How had I forgotten about this lover Richard of the past, the one who wrote me love poems and saw me the way I saw myself when I went deep inside? Curious about where he might be now, it didn’t take but a moment to find him through an internet search, and there he was looking into my soul once again from the photograph in a Wikipedia entry chronicling his life and career. Successful playwright, comedian, artist, writer, father. I was twenty-two years old again, feeling very stylish with my long thick hair flowing out of a Barbra Streisand style cap, the kind she wore in her movie ‘What’s Up Doc’, subdued after a rowdy weekend just spent with a college friend, on my way back to New York, waiting for the train to start moving again after its stop in Philadelphia. He was standing in the aisle, handsome with shocking blue eyes and a slightly-crooked mouth that was demanding to be seen. He was staring at me across the empty seat that he politely asked to sit in. I don’t think it was even ten minutes before he had me doubled over in hysterical laughter with a spontaneously inspired chihuahua routine. He had my heart before we even pulled into NYC. We exchanged numbers on the platform at Penn station. Our love affair took off like a comet, intense and hot. And like a comet, when the short life of the flare couldn’t be sustained, the love affair ended abruptly. We were together four months. And then he was gone. You’re showing us how life infuses the creative process…. I’m ready for installment #3!